Office Space - Solingen, North Rhine Westphalia. 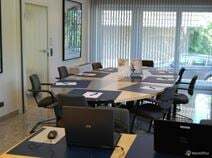 A selection of elegant offices, meeting rooms/conference facilities equipped with air conditioning and a full range of facilities and services are available to let within a prominent building in Solingen. There even provide complementary beverages so that you can work comfortably and recharge throughout the day! The building enjoys direct access to the motorway and is excellently connected to the surrounding areas.